It has been a while since “beer yoga” arrived in Korea, after being embraced by Berlin hipsters. 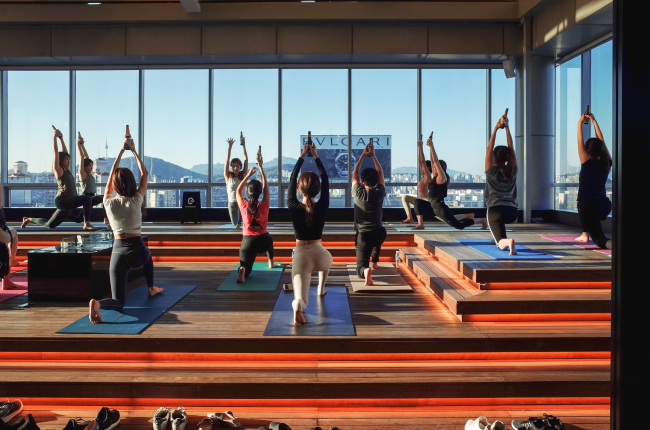 A one-day beer yoga class was held Saturday at PGA Golf Academy in Sinsa-dong, southern Seoul, organized by yoga instructor Hwang Ji-hye and yoga clothing brand Almondon. 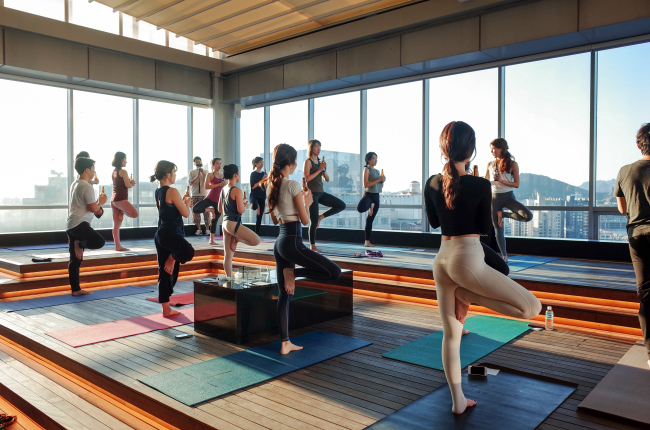 Some 15 participants, mostly women in their 20s and early 30s, gathered on the rooftop to enjoy yoga and beer at the same time. Some were yoga enthusiasts, seeking an unusual yoga experience. “There are also people who think that yoga is too difficult for them to try. This class helps them think, ‘Oh, maybe I can just have a bottle of beer,’” she added. 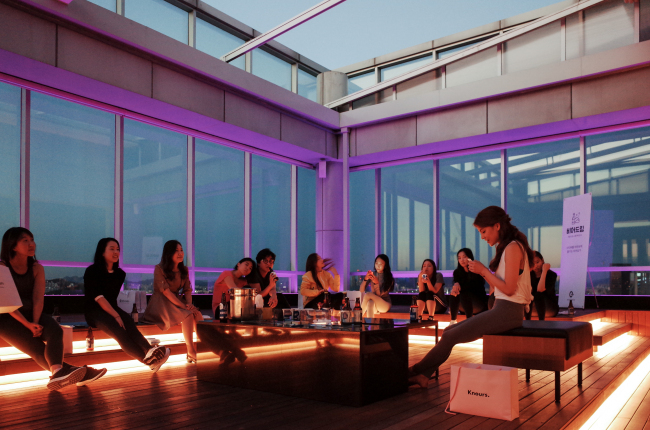 The yogi led her first beer yoga class in June last year, collaborating with local multiplex cinema chain CGV. Since then, she has been conducting beer yoga classes for the general public and numerous companies as part of their teambuilding exercises. Though it is billed as beer yoga class, the exercise may be challenging for those who love been more than yoga, as the point is not to drink the whole bottle at once. Participants can slowly take a sip, emptying a bottle over the course of the 90-minute class. “A bottle of beer weighs around 500 grams, equal to that of a light dumbbell. As we do yoga, you can fully feel the weight in your hand,” Hwang said. Saturday’s lesson started out just like any other yoga class, channeling the energy inside one’s body by finding the perfect balance. After awakening the body with some stretching movements, it was time for the beer to kick in. The participants were instructed to practice some poses using the beer bottle. But quenching the thirst with beer did not come easy, as they were barely maintaining balance on one knee and one ankle. Some of the exercises called for teamwork. Holding hands with a partner in front, the participants did a squat. While their legs trembled, the yogi instructed the participants to make a toast and drink the beer. After the class, the group gathered in a large circle, again with a bottle of beer in their hands -- but this time, it was purely for drinking, and to share their worries and concerns. “It was more than just doing yoga. It was an energy transition, having beer under the sun, while practicing the yoga movements,” a participant said.